Summer’s approaching and the school year is slowly drawing to an end – which leaves little time for a busy events calendar. So, in June, we’re taking it slow. Not to say that there aren’t some interesting events to look forward to. Studievereniging Kitsch is wrapping up the school year with two final events. First of all, there’s the Eindejaarsavond: a final official members’ meeting followed by a reception. It takes place on June 15th in room 12A-39 and will start at 18:00 with a tasty buffet. As a final event, Kitsch is organizing an excursion to the Arnhem Mode Biënnale on June 22nd. There’s only room for 15 people, who will benefit from a reduced entrance fee of 10/15 euro (members/non-members), including a guided tour. If you want to join, contact the Kitsch staff quickly! For more information, visit the Kitsch website. 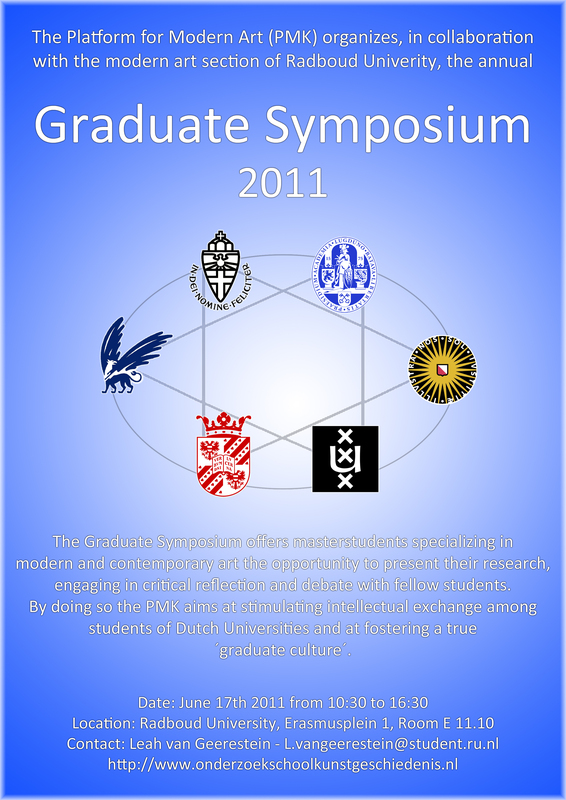 Also, we want to remind you of the PMK Graduate Symposium taking place on June 17th in Nijmegen. During this symposium, students in Modern and Contemporary Art from different universities will present their MA theses, either as finished products or as works in progress. Speakers are Daria Tuminas (RUL), Marijke Goeting (RU), Mariana Bufill (RUL), Michelle Franke (RU), Mark van Gend (UU) and our own VAMA-students Daniël van der Poel and Stefaan Vervoort. It’s a great opportunity to engage with other people’s research and to find some inspiration and guidance for your own! Critical Studies in Art and Culture (formerly Visual Arts, Media and Architecture, a.k.a. VAMA) is an international research master's programme at VU University in Amsterdam, focusing on the critical analysis of art and culture - with a focus on visual arts, media, design and architecture. This website contains information for both current and prospective students. Click to receive our monthly updates.